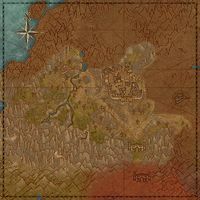 Eyebright Feld is the southwestern region of Rivenspire. 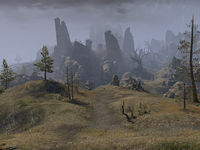 It includes the city of Shornhelm, and Crestshade to the west. It also includes Moira's Hope in the east, but not nearby Hoarfrost Downs. The Eyebright Feld Dolmen lies southwest of Crestshade in the westernmost portion. To the south is the gateway to Stormhaven. To the north is the Boralis region, while Westmark Moor borders to the east. Fevered Mews — A cave system in the hillside behind Shornhelm. These side quests count towards the Rivenspire Adventurer achievement. For Covenant storyline quests which also contribute to this achievement, please see Rivenspire Quests. Assassin Hunter: Hunt down a Montclair assassin. The Assassin's List: Recover the assassin's list of targets. The Blood-Cursed Town: Help free a cursed village. Children of Yokuda: Stop a group of deserters from poisoning Shornhelm. A Dagger to the Heart: End the Montclair threat for good. Dearly Departed: Help give a family a proper funeral. Fadeel's Freedom: Help fulfill the last wishes of a dead man. Friend of Trolls: Deliver a research journal about trolls. Hope Lost: Help the people of Moira's Hope. In the Doghouse: Help find a missing husband. Rusty Daggers: Defend a Horseman settlement from harpies. The Sanctifying Flames: Help burn the dead in the Light of Arkay. The Spider's Cocoon: Rescue a man's friend from a spider-infested cave. A Spy in Shornhelm: Discover the Montclair spy in Shornhelm. Threat of Death: Defend Ravenwatch Castle from attack. Under Siege: Help rescue a contingent of Shornhelm soldiers. ​ Hero of House Tamrith 5 Kill Reezal-Jul at Camp Tamrith and save the Crestshade refugees. This page was last modified on 10 November 2017, at 19:18.